The term wind energy refers to the kinetic energy created by the wind in order to produce wind power. Wind energy can be converted by a wind turbine that does just that. However, if the wind energy is harnessed to create mechanical energy the tool for that still may be called a wind turbine or a wind power plant. When mechanical energy enhances a unit by harnessing wind power, it may be called a windmill, wind pump, or wind charger. Wind energy can be used for anything from power on boats, battery charging, or electricity to be used commercially. In Europe, windmills were first seen in the 11th century. Wind turbines generating electricity were reportedly first used in the late 1800s, first in Scotland. Quickly, the technology moved to other locations such as the United States and United Kingdom. By the early 1900s Denmark and America were producing and using windmills for water pumping and on farms. Wind energy is often created on farms where it is easy to install turbines and they allow animals to still graze on the surrounding land. Wind turbines either have a horizontal or a vertical axis. Horizontal axes turbines are more common, yet older. According to National Geographic, "One of the largest wind farms in the world is Jaisalmer Wind Park, a series of connected facilities in the state of Rajasthan, India. In April 2012, Jaisalmer produced 1,064 megawatts of electricity, more than any other onshore wind farm in the world." Boats with wind sails were used many years ago to transport people and cargo on the Nile. National Geographic sites Walney Wind Farm as an example, by stating "Walney Wind Farm...is a farm of 102 turbines in the Irish Sea off the coast of Cumbria, England. Walney is the largest offshore wind farm in the world, generating 367 megawatts of power." Lake Turkana in Kenya has 365 turbines between two mount systems. Strong, steady winds that are predictable make this an idea location to generate wind energy. The Gansu Wind Farm is currently being built in China. It should, upon completion, produce 5,160 MW of electricity. The first wind farm was created in the 1970s in New Hampshire in the Crotched Mountain. The biggest wind farm in the United States in in California. At Alta Wind Energy Center there are 300 turbines. Wisely located in the Tehachapi Pass, between San Joaquin and the Mojave Desert, the area is extraordinarily windy. Now you have seen several real-world examples of wind energy. "Examples of Wind Energy." YourDictionary, n.d. Web. 23 April 2019. 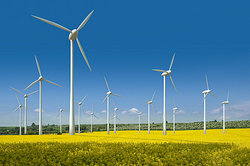 <https://examples.yourdictionary.com/examples-of-wind-energy.html>.